Political risks have been at the forefront of investors’ minds but this has failed to curb risk appetite as international equities have been fairly flat. Instead, the reactions have played out in other markets such as currency, fixed income and gold. Fixed income and gold both performed well in the past month as both are seen as traditional safe havens. Locally, the S&P/ASX 200 continues to drift lower, falling circa 3% over the past month as financials continue to be under pressure following the Federal Budget, weaker than expected results, and the downgrade of the non-major banks by credit ratings agencies. Commodities continue to suffer with iron ore falling below US$60 per tonne. Oil also drifted lower despite the Organisation of Petroleum Exporting Countries (OPEC) and other major producers agreeing to continue to cap production through to the end of the year. The Australian Dollar has regained all of its recent losses to above 75 US cents as worries around the Trump administration re-emerges, and some better than expected Australian economic data. Headline Australian employment figures were positive again this month, although unlike last month’s strong full-time figure, this month’s numbers were boosted by lower quality part-time employment, driving the unemployment rate down to 5.7% from 5.9%. Wage growth and business spending continues to be anaemic, resulting in continued concerns over Australia’s ability to grow at the rate that both the Reserve Bank of Australia (RBA) and the Australian Treasurer have predicted. Gross Domestic Product (GDP) growth was a small 0.3% for the quarter but the RBA continues to state its belief that a recovery is underway as it held rates again this month. Meanwhile, US economic data continue to be mixed, with growth indicators still good but this has not fed through to employment and wages. Employment figures were weaker than expected although the unemployment rate fell to 4.3% from 4.4% primarily due to a lower number of people looking for jobs. Wage growth showed no signs of picking up, continuing at the monthly pace of 0.2%, which is inconsistent with the tight labour market indicated by the low unemployment rate. Elsewhere, Europe continues to perform well while China continues with its efforts to balance growth and its high debt levels through tightened short-term lending rates. Currency movements are notoriously known to be difficult to predict due to the confluence of factors that play a role in pricing cross-currency rates such as the Australian Dollar and US Dollar. Everything from politics to economics to social changes can affect a currency’s value and the actual impact of any the aforementioned variables is difficult to predict. As a result, economists have come up with various theoretical models to explain currency movements but have not been able to settle on a ‘best practice’ one, resulting in wide-ranging opinions across the spectrum. Investment professionals generally use technical analysis in the effort to predict short-term moves. Generally, short-term currency movements are largely influenced by headline political or economic surprises which is, by definition, an unexpected or unpredicted event. Last year, Brexit sparked a sharp fall in the British Pound Sterling, while Donald Trump’s election resulted in a run of gains for the US Dollar (these US Dollar gains has since been reversed as the difficulties of the Donald Trump administration continues to make headlines). Longer-term views are generally predicated on a combination of macroeconomic views and long-term fundamental analysis based on purchasing power parity (PPP). Assuming that the currencies are freely floated with no government intervention, PPP is a theory that the exchange rate between currencies are driven by the purchasing power in the respective countries. The theory states that the exchange rate is fair value when the purchasing power between the two countries are equal. The reality is slightly different. Exchange rates do exhibit a tendency to follow the purchasing power parity theory but there can be times of significant deviation. The chart above plots the actual value and the calculated PPP value provided by the OECD. Note that there have been several exchange rate regimes since 1960. Up to 1970, currencies were fixed to the post-war exchange-rate order, with the AUD then being pegged against a trade weighted basket before being floated in 1983. Even after the float of the AUD, there has been occasional interventions by the RBA to manage the currency. The impact of these interventions is difficult to account for but the general reversion towards the PPP-implied value can be seen. The large deviations of the actual exchange rate with the PPP-implied exchange rate can also generally be explained by economic shocks. 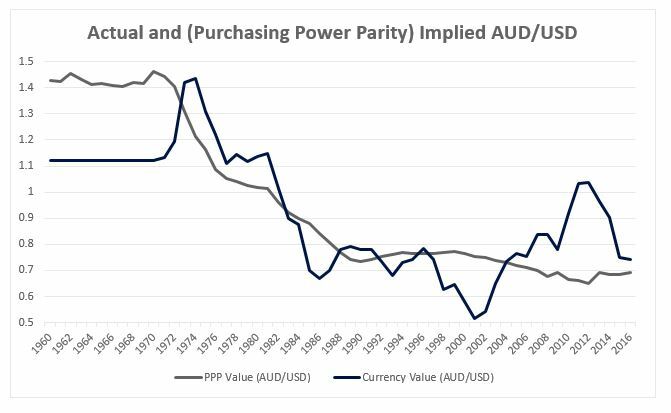 In the late 1990s/early 2000s during the Asian Financial Crisis resulted in the AUD trading below its PPP-implied fair value, while the subsequent ‘tech-wreck’ seemed to keep it there as risk-sentiment was low. From the late 2000s onwards, the China-led commodity boom appears to have driven a large overvaluation of the AUD. Over the past few years, the AUD has fallen sharply following a slowing of China’s growth and subsequent correction in commodity prices which has brought the AUD much closer in line with the PPP-implied exchange rate. Whilst the PPP-implied exchange rate gives us a basis for our views on a currency, history has shown that deviations can last for long periods of time and are also greatly influenced by the state of the global economy.